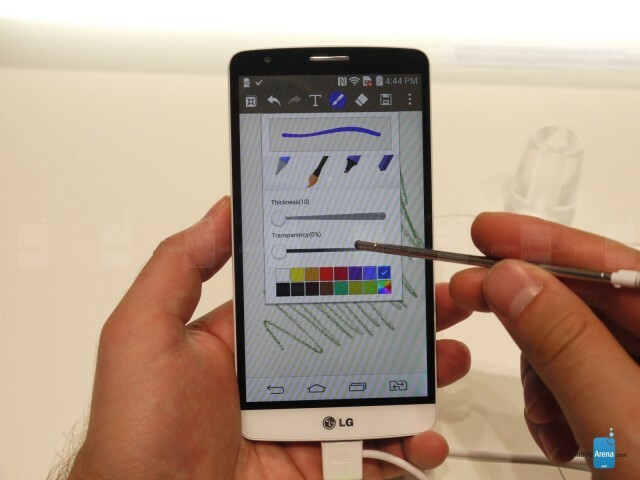 LG’s new budget based smart mobile is the LG G3 stylus; let’s see the important specifications of the LG G3 stylus. LG G3 Stylus is a slender mobile with 5.5 inches screen and it has the qHD display with the 540×960 pixels of resolution and the screen as the few physical button as power on button, volume up and down button, which has the 149.30 x 75.90 x 10.20mm of dimensional with 163.00g of weight. This slender slightly chunkier has the plastic feels on the cover. 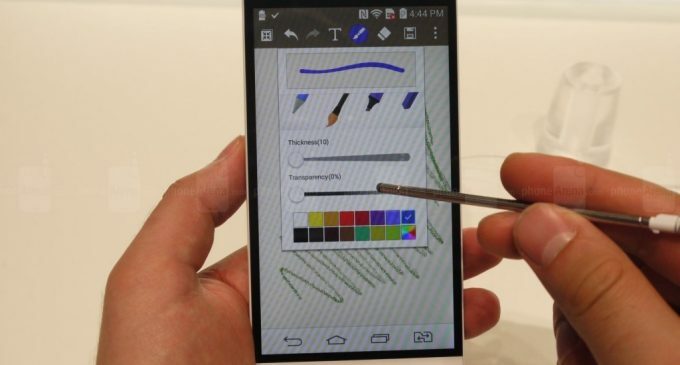 The new LG G3 Stylus powered by the quad-core processor clocked with the 1.3GHZ and runs with the backbone of Android OS, v4.4.2 (Kitkat), which will sense with the help of Accelerometer, proximity and compass sensors. The G3 stylus has the removable type of Li-Ion battery with 3000 mAh of capacity, which offers good talk time as well standby. The memory management of the LG G3 Stylus has 1 GB of RAM and 8GB of internal memory and it can be extended with the help of additional MicroSD card up to 32GB. The G3 stylus offers 13 mega pixels of rear camera with 4128 x 3096 pixels of resolution, autofocus and LED flash and so on, which has the features like Geo-tagging, touch focus and face detection. It also allows you to do the video call by 1.3 mega pixels of front facing camera. In LG G3 you can find many features under connect GPRS, EDGE, HSDPA and HSUPA Speed, WLAN, Bluetooth and USB; you can get this slim and stylish LG G3 stylus in three different colors such as the Black, White and Gold. 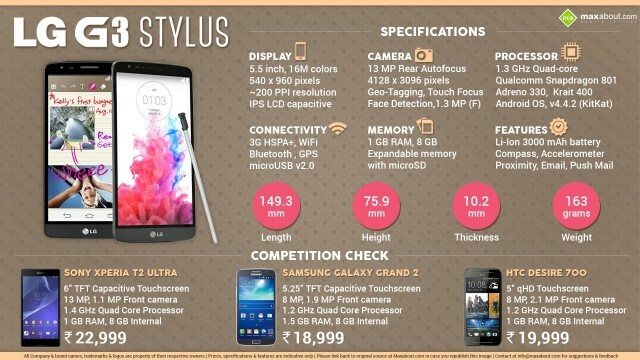 These are the important features and specifications of the upcoming LG G3 stylus budget based smart mobile, so wait for some days to know more about the performance of it.